Santa Catalina Island in Los Angeles, CA - 3D Map 24 x 30 IN - Laser carved wood nautical chart and topographic depth map. Express your lake pride and have a memento to honor your memories for years to come. 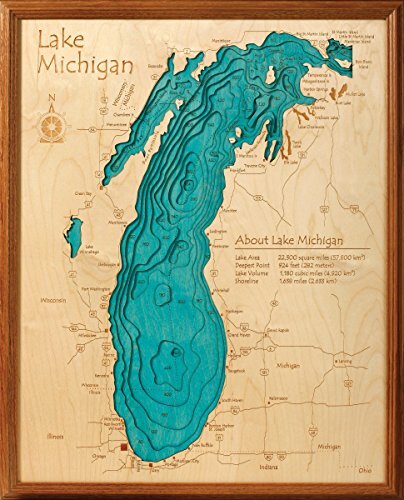 This 3 dimensional laser cut lake map is accurate and it is beautiful. It is a wonderful way to explain everything about your lake to family and friends. You can use it to thematically decorate your walls as it adds an instant lakehouse feel to any space. A 3D laser caved depth map is a unique piece of art for those who admire your lake. We are proud to have this lovely piece of art in our inventory and know that all lake enthusiasts will love it as much as we do! You will have no regrets with this purchase! You will love it! Bitterroot Lake (Little) in Flathead, MT - 3D Map 24 x 30 IN - Laser carved wood nautical chart and topographic depth map. Chesapeake Bay (South Bay) (Newport News, Virginia Beach, Norfolk) in , VA - 3D Map 24 x 30 IN - Laser carved wood nautical chart and topographic depth map. Charleston Harbor in Charleston, SC - 3D Map 24 x 30 IN - Laser carved wood nautical chart and topographic depth map. Nolin River Lake in Grayson Edmonson Hart, KY - 3D Map 24 x 30 IN - Laser carved wood nautical chart and topographic depth map. Lake Norman (Southern Section) in Mecklenburg Lincoln Catawba Iredell, NC - 3D Map 24 x 30 IN - Laser carved wood nautical chart and topographic depth map. Puget Sound in Kitsap, WA - 3D Map 24 x 30 IN - Laser carved wood nautical chart and topographic depth map. Lake Hartwell in Oconee Anderson Pickens Stephens GA Franklin GA, SC GA - 3D Map 24 x 30 IN - Laser carved wood nautical chart and topographic depth map. Rinehart Lake in Portage, WI - 3D Map 24 x 30 IN - Laser carved wood nautical chart and topographic depth map.